Written and curated by the UrbanStems team, The Perennial is inspiring others with DIY projects, floral tips, and creative ideas. Happiness starts here! Saying goodbye to your flowers is never easy. But thanks to this DIY project, you never have to part with them again. 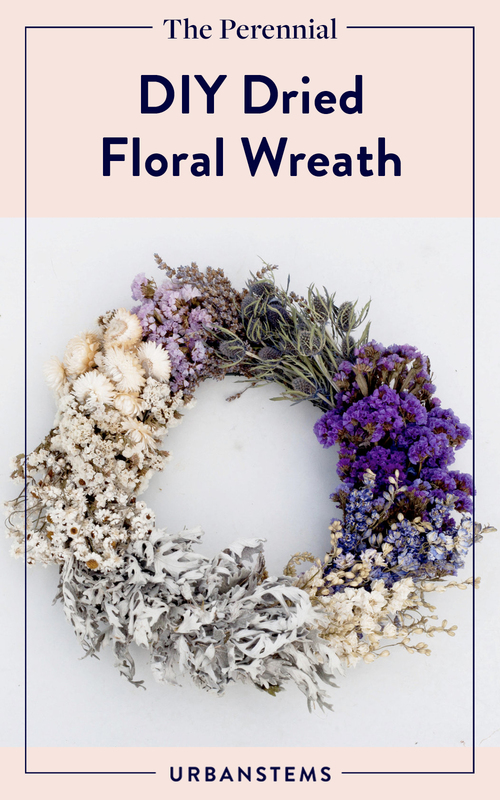 We asked our friend and farm partner Rose Robson, owner of the Robson Family Farm in New Jersey, to share how she creates her stunning dried wreaths. To dry your flowers, hang your bouquet upside down in a dark but well ventilated area to ensure bright colors and good air flow. After the bouquet is dry, trim the stems to be about the length of your hand and separate your flowers into mini-bouquets. For a 12-inch wreath, you’ll need 10-11 mini wreaths to complete the full circle. If you’re making a square wreath, you’ll need to make 20-24 mini bouquets. 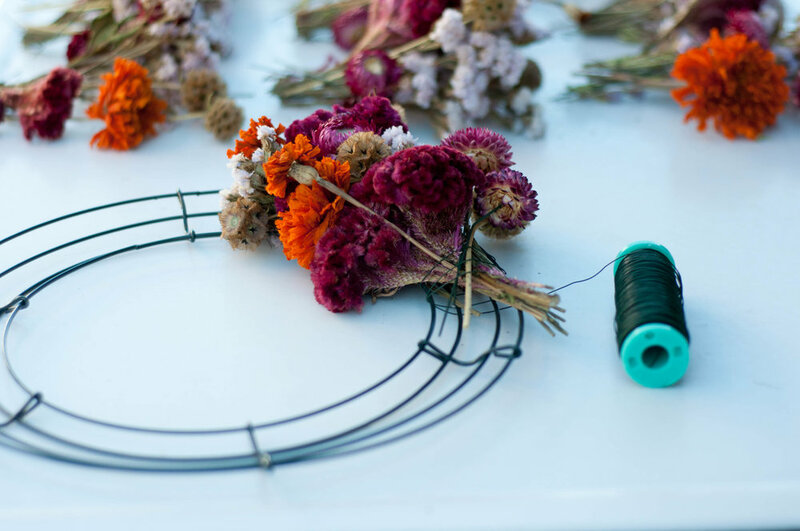 Once all of your mini bouquets are made and laid out, you’re ready to start tying. Take your wire and circle it around the outermost part of the wreath several times so it’s secure. Then, grab your first flower bunch and encircle it in wire 3 times. Add your next bunch so it covers half of the first bunch. And then repeat until you get to the final bunch. The final bunch is the most tricky because you don’t want any wire exposed. You will slip the final bunch gently under the first and wire it, weaving under the foliage from the first bunch. You will definitely need to “fluff” and manipulate the first bunch over the last to fully cover the wire. Make a hanger using wire to form a little loop. Once it’s done, Shellac your wreath to give the delicate flowers a little extra strength. Instead of making a full wreath, you can also create an arch and use a silk ribbon to tie it all together. Voila! 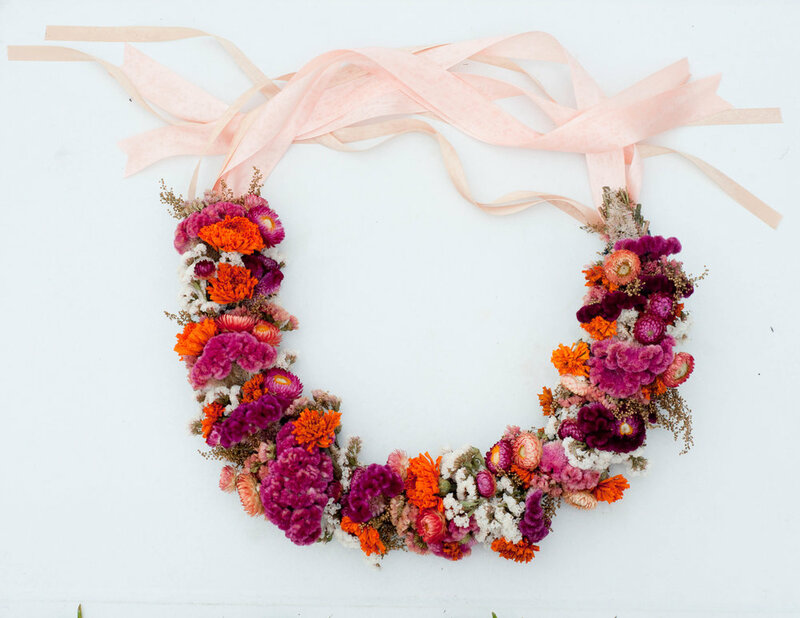 Hang your wreath on a door, over your bed, or wherever you’re looking to add a floral touch. Want to make your own wreath with Rose at the Robson Family Farm? See the offered classes here. Rose is the Owner of Robson's Farm in North Hanover, NJ. Fresh inspiration delivered with love to your inbox. Get the latest inspiration and updates from the UrbanStems team. You know a good thing when you see it! Thanks for signing up – you'll be the first to know about new collections and our latest UrbanStems updates.